Following the completion of the renovation works at Cawdor Hall, there are three units available on the ground floor and one self contained unit available on the South facing side for business rental. The units are available at a low rental price and without business rates. Currently all units are taken but a waiting list is open. For further information please contact the Development Officer Sally Thomas. Please include details of your background and what your proposed business entails. 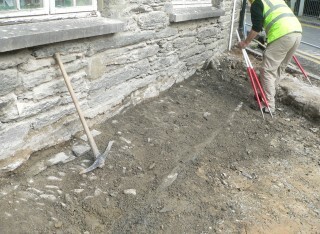 The main external restoration works for the hall included re-pointing and re-roofing of all elevations. A new glass canopy extension was built over the courtyard. The WC's were re-sited and existing windows were overhauled or replaced. Internally, a new Interpretation Centre with access through to Hanes Emlyn and a new business unit was created. Thomas MacRae Ltd, a local building company were successful with their tender for the works to be carried out at Cawdor Hall. 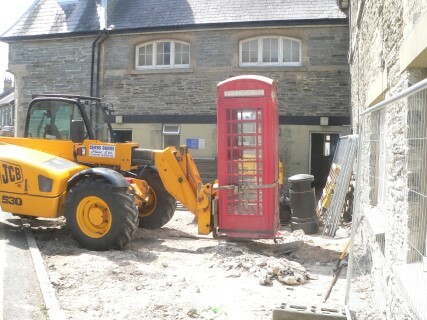 Site preparation got underway in the courtyard during the week commencing 14th of July 2014 and good progress has been made. 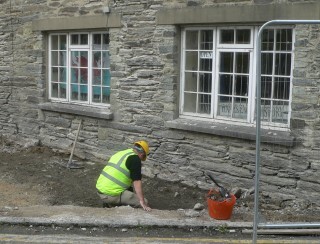 Paving stones were removed, walls prepared for re-pointing and the toilets have been cleared and the floor dug up. 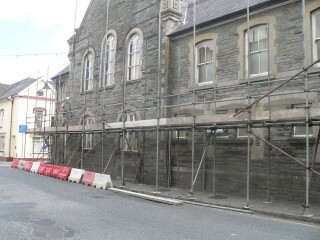 During the next few weeks scaffolding will be erected which will allow the builders to continue with re-pointing the walls and to start re-roofing. The scaffolding was erected on all elevations of Cawdor Hall. 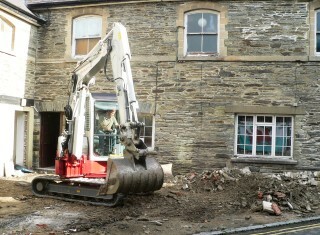 The rubble from the courtyard was cleared away to enable the excavation of the courtyard earth. Archaeologists were present during the excavation, but no hidden archaeology was found. The foundations for the steel frame of the glass canopy were set. Hacking off and repointing of the walls continues and re-roofing has begun. Excellent progress has been made on the re-roofing, with over half of the total area completed. Rainwater goods are overhauled as the roof is completed. Refurbishment and overhaul of the existing windows and re-pointing continues. The chimney stack on the North elevation has been taken down and is currently being re-built. Externally the roof has been completely re-slated, with the majority of the walls being re-pointed, all of the windows that were to be replaced have been fitted with new sash windows, whilst the remainder are in the process of being completely overhauled. 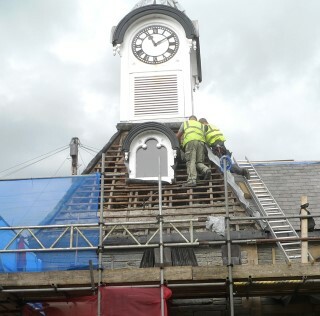 Unforeseen extensive repair work has been completed to the chimney and the clock tower, along with sandstone cleaning and repair. 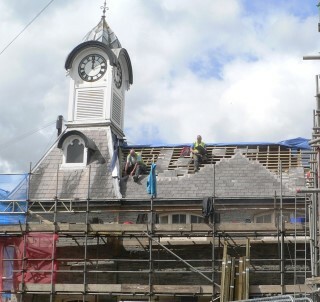 Sections of the scaffolding around the building has been removed, allowing for further re-pointing and slating of the lower roof on the North elevation. 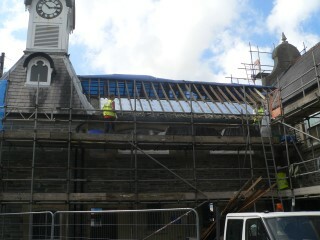 Work has begun to reinstate the glass canopy over the courtyard area. This will provide another useful space for community groups to meet, a venue for craft fairs, exhibitions and to showcase local talent. Internally, following the re-design of the ground floor public toilets, the hall will host the Town Council Chamber room also available to hire as a meeting/training room. A new Interpretation Centre linking into the town’s local history group, Hanes Emlyn will provide an interactive experience for residents, schools, community groups and visitors. The remainder of the ground floor will be divided into business units available to rent. Scaffolding has been taken down on the North elevation and around the courtyard. Work is nearing completion on the West elevation with only some sandstone inserts to be completed before the remainder of the scaffolding can be taken down. The canopy steel frame is complete, with the timber roof structure progressing well. The concrete slab is in place and the new roof is slated. The contract for the renovation and restoration work has been extended to the end of January 2015.